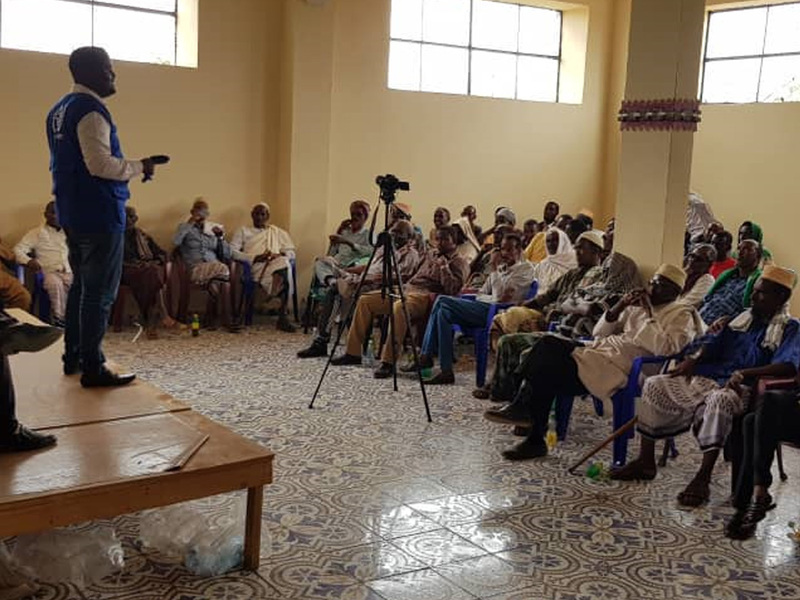 Jubbaland – IOM, the UN Migration Agency, in partnership with the Jubbaland State launched the Afmadow Community Action Plan (CAP) in Afmadow, Somalia on 29 September. This followed a similar launch in the previous day (28/09) in Garbaharey district. As part of the Midnimo (a Somali word for “unity”) project, led by the Federal Government of Somalia and implemented jointly by IOM and UN Habitat with funding from the UN Peacebuilding Fund and the UN Trust Fund for Human Security, the CAP results from inclusive consultations between various socio-economic groups, including internally displaced persons (IDPs), returnees, women, youth, and host community members. It lays the foundations for governance, cohesion, durable solutions and peace. The Community Action Plan will be reviewed quarterly and upgraded accordingly. The community action plans outline an inclusive common vision and prioritize projects for peaceful coexistence and sustainable development. “Today is a historic and unforgettable day for Afmadow District; we are very excited to see the community identified projects from our own hearts that have been accepted and taken forward to the implementation phase,” said Sheikh Mohamed Dakane, Afmadow District Commissioner, during the launch. “As the government, we have never ever seen a project like Midnimo where the community are full drivers of the process and we are here officially to launch the CAP and lay the foundation for six community projects,” he added. Both events, in Afmadow and Garbaharey, were led by the Ministry of Interior, District Commissioner and community leaders, and attended by government representatives, including from the Governor’s office and Jubbaland Refugee and Internally Displaced Person's Agency. Representatives from the diaspora and local and international NGOs, including Norwegian Church Aid, American Refugee Committee, Gedo Women Development Organization, among others, were present. Also, in attendance were community groups, such as representatives of IDPs and returnees, women, youth, community elders, religious groups, vulnerable members of the community, and business community members. Authorities applauded the Midnimo partners for facilitating the community-based planning approach and urged all actors to use the action to guide their interventions and fundraising efforts in coordination with local authorities. In Garbaharey, IOM will support four projects identified in the CAP, namely, the construction of the airport terminal hall, a health centre, meat market, and extension of Gogol Primary School. The launch resulted in various pledges to support other community projects. The World Food Programme and UNICEF, through the Gedo Women Development Organization, will manage the proposed health centre in Garbaharey. Jama Abdullahi Ugas, the Director of Social Affairs from the Governor’s office, urged the community to work closely with the local administration to strengthen the security situation in the town. “We couldn’t have gathered here and have this important event if there is no security in this town. This is made possible due to the cordial working relationship with the community and the local government and we are always encouraging you to double your efforts to achieve your goals,” he said. 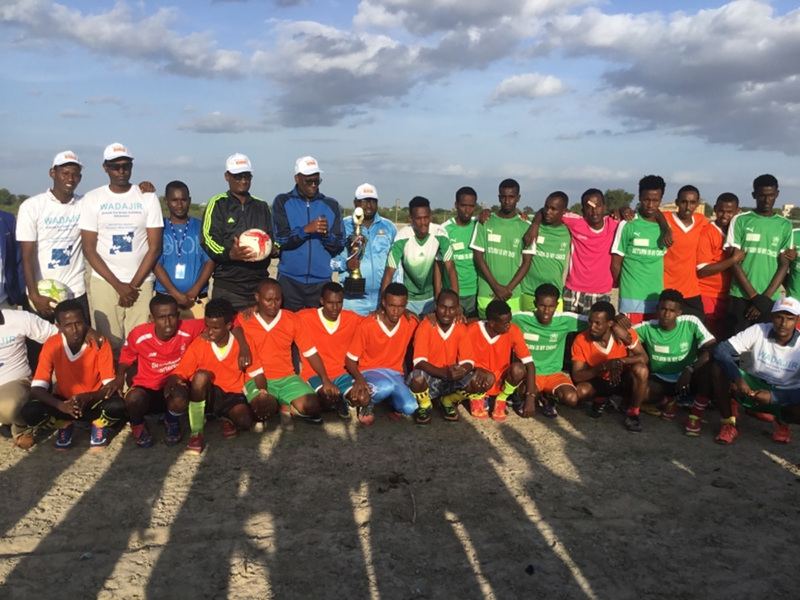 Friendly football matches then took place after the CAP launches in both Garbaharey and Afmadow, during which young IDPs, returnees and host community members used sports kits donated through the project. The Garbaharey CAP launch and sports event were equally aired live on Jubbaland State Television and radio. View it here: https://www.youtube.com/watch?v=W2eJPGQycKY&feature=youtu.be.